Truth is, you still need wind. Fuel of some kind. Every engine – your career, your business – needs to be fed. Now before we get too deep in allegories let’s narrow things down just a bit. And let’s try to get specific enough so it can help us. There’s internal fuel and external fuel. We need both. I’m no sailor, but if we stick with that imagery, a sail boat won’t sail itself. There have to be people who operate it. Somebody has to set the sails, navigate and guide it. That’s the internal power. The wind is the external. Without wind you’ve just got a bunch of people sitting around on a boat going nowhere. Some call it a party barge! As fun as it may sound, you don’t want your career or business to resemble a party barge. It’s more than desire. It encompasses things we don’t want, things we want to avoid — but mostly it includes the actions that energize us. Actions over results is really tough because we romanticize results. We envy the big house, the nice cars, the scenic vacation sites. Results, results, results. It’s what everybody wants. Unfortunately, no matter how badly you want more money, or the things more money will bring – that doesn’t address actions. I live in the Dallas/Ft. Worth area. Eleven hours up the highway is Nashville. If I’m chasing a result of being in Nashville, I’ve first got to decide what actions will get me there. Supposing I prefer driving over flying, then I’m going to lean toward driving if time will permit. Why drive when you can fly? Because I may prefer to drive. Driving may be action I love while flying may be action I hate. I’ll do what I hate if I have to, but left to my own devices — I’ll always do what I love over what I hate. You will, too. The result is getting to Nashville from DFW. How to get there is answered by an inner fuel. Or indifference. Maybe I just don’t care. A bus. A car. A plane. Hitch hiking. Motorcycle. Bicycle. I don’t care. Just get me to Nashville. That’s how some of us are with our careers and businesses. That’s a tough row to hoe. I’ve long been fascinated with creative spaces, especially musicians. Speaking of Nashville, thousands of people move their annually looking for stardom. Some just want to be a music star. Maybe they don’t care how they get there. “Just get me there.” Others go there because they’re in love with an action – songwriting, playing or performing. Or all three. I’m not saying you can’t be successful by merely focusing on the result, but it’s MUCH bigger grind than getting up each day loving what you do. People call it passion. That’s too cliché for me. And it’s too shallow, if not limiting. We’ve got to have some kind of aptitude for what we love. Remember, we’re focusing on actions, not dreams. What do you love to DO? What do you love to do that you do reasonably well? Some things just are. And it can be unexplainable. Just like natural ability, or aptitude. This inner fuel can be difficult to figure out because it hinges on self-awareness. Mostly, it hinges on knowing what your super powers are. Yes, you have them. Their degree of super-ness might not be spectacular, but they’re your strengths. It’s what you’re best at – and it’s what gives you energy. You love it. You enjoy talking about it. Thinking about it. Planning it. Practicing it. Doing it. Here’s where it gets cumbersome. Is it something you can translate into a career or business? Throw me a curve ball if you want. I’ll hit it. I may not hit it out of the park, but I’ll make solid contact. I’ve never sat down to examine what somebody gets excited and energized about and been stumped at how to help them translate that into their business or career. More often than not, it’s not that hard either. Sometimes we just have to make a minor adjustment in our perspective. I’m a rock solid behind the scenes guy. Some people are “front of the camera” people while others of us are “behind the camera.” I’m behind. That’s where I’m more comfortable. Now, that’s not to say that I don’t enjoy public speaking, or being in front of people. My “behind the camera” wiring is slightly different than that. I love helping other people climb higher. My fuel gauge moves closer to FULL when I’m helping somebody figure out something that will move the needle on their business or career. That self-awareness helps me go all in on one of my super-powers. I don’t worry about trying to be something I’m not. I’m way too happy to shove my chips into the middle of the table to help somebody reach the next rung on the ladder. The real heart of it is the depth of the service though. It’s a lot less about being behind the camera and it’s more about going deep with people. It’s not even a conscious thing. It’s one of “how it is” kind of things. So my career has pretty much mirrored that because to go any other way is more draining on me. Fly-by service frustrates me. Well, that’s an understatement. It drives me nuts. I sit down with somebody and they confess some struggle…I have to help if I’m able. I can’t just sit there passively, listen, then get up and say, “Well, good luck. I hope it all works out.” No, I’ve got to get involved. Years ago during a period of reflection – especially on my youth – I realized I did it as a kid in grade school. I’ve always been a person who got involved. If friends got into conflict, I stepped in to make peace. If a classmate was crossing the line that might get them in trouble with a teacher, I’d urge them to stop before they got in trouble. Look closely enough and you’ll see things in your own life (and childhood) that indicate where you get an energy boost. Is it the work or is it the results? Destiny usually denotes results. Of course, without the work there are no results. As for ownership, it’s easy to own the results if they’re positive. Less so if they’re not. What about all the days, hours and minutes we spend doing the work? That’s the real focus of today’s show – the work. The things you do every single day. The stuff that consumes your time, your energy and your mindspace. The painter paints. The writer writes. The singer sings. The painting, the writing and the song all matter – but every single day, the art is found in the work, not the object created. Destiny is influenced not by what we dream about, but by what we do. It’s in the actual work! What do you love to do? What actions (and thoughts) give you energy? That’s where you should focus more attention. Too many business owners and executives devote themselves (or they devote too much time) to areas too far from their strengths. Sometimes they think it’s required…that if they don’t, their teams will see them as weaker. Sometimes they lack self-awareness to know their true strengths and how to best leverage those. And sometimes it’s completely different — we’ve all got stuff that gets in our way. Stop being something you’re not. Stop trying to be somebody you don’t want to be. They listen too much to other people who don’t have their best interest at heart. They compare themselves with others. When you think about the actual work you do – ask yourself what impact these two things have on your work. Who are you listening to? What are they telling you? Think about things from their perspective. What considerations are important to them? It doesn’t make them wrong, or bad. You just need to understand. We all have wants and desires. We approach situations with a viewpoint that most often strongly considers what’s ideal for us. That doesn’t make us selfish. It makes us human. Even so, it’s possible for a person to fail to consider the outcome for others. It’s also possible for a person to strongly consider the outcome for others. There are no truly objective perspectives. We all have viewpoints that enter our judgments. Perhaps the best we can hope for is to accurately identify them. Let me confess my viewpoint and my bias. As a servant to top leaders and business owners, I want my service to be highly valuable. I want my clients to not only sense value in my work, but I want it to make a meaningful improvement in their career and work. While I’d like to work with them for some length of time, I’m not working to make them dependent on me. I’m working to make them better and hoping that ongoing improvement prolongs my opportunity. But it’s very individual in my work. For some, the objective is navigating through some present distress. When that distress is passed, I feel like my work is done and I’m like a proud parent ready to see a grown up child go make his own mark on the world. It’s not hard to walk away knowing I’ve served well. I’m a mature, seasoned business guy though. And that plays a major role. All my work – ALL of it – is currently legacy work. Yes, I want to earn money. I want to provide for my family a comfortable lifestyle, but that’s not the driver. The driver is to pass on what I’ve learned. To help. To serve. To teach. To train. To provoke. I’m never shy about my end game. It’s neither right, nor wrong. It just IS. But I’m honest and candid about what it is. No client ever has to wonder where I’m coming from. Most appreciate it. On very rare occasions, some don’t. That’s fine. I make no apologies and I maintain complete candor. The rest is up to the client. Problems enter when people behave or act as though they don’t have an agenda. We all have an agenda. I’ve just confessed mine. When a CEO has board members who encourage a decision, saying they just have the company’s best interest at heart – maybe they do, maybe they don’t. The CEO has to figure that out. You’re not shocked to know that not every board member has the best interest of the company in mind 100% of the time. CEO’s can be pressured or swayed into actions – work – by well-intended board members who have an agenda that may not be congruent with the agenda of the CEO. That doesn’t mean the relationship has to be adversarial. It just means the CEO better have a a good understanding of what’s really going on, or he’ll find himself doing work that isn’t in his best interest, or the company’s. He may end up trying to be something he’s not. The corporate landfill is heaped high with CEO’s who surrendered their strongest skill set (and love) with things others thought was best. Comparing ourselves with others is a hazard we’re all prone to step into. Sometimes it’s a shallow puddle. Other times it’s quicksand that we can’t find our way out of. This is your life. Nobody else’s. When I was growing up there was a popular TV show called, This Is Your Life. It was hosted by Ralph Edwards and somebody famous would be fooled into coming on set, thinking they were going to a party or something. The show would chronicle the person’s life, going back to childhood and a number of important people from the person’s past would appear, surprising the show’s guest. It was live TV’s version of a biography of a living person, with that person sitting on the sofa on set. It indeed was THEIR life. Your life may not be the subject of a live TV show, but it may as well be. What if you thought of it that way? What if starting right now – at this very moment – you considered your life as being on that old TV show? I’ve watched many episodes of that show and never was the focus on the guest’s life compared to somebody else’s. What a boring show that would have been! No, it was always about their life – warts and all. It was a story of what went right, what went wrong, what they learned, who was important, what role they played and what the guest had accomplished. It was their story…uniquely their own. And so we watched, because their story was different from others. Stop trying to copy others. It won’t work anyway. Except to frustrate you, make you feel inferior and fuel your discontentment. I know CEO’s and business owners who don’t crack 6-figures in annual income. I know others who make millions every year in personal income. What difference does it make? Should the $90K CEO pay closer attention to the $40M CEO? If they should, why? What is there to be gained other than jealousy or envy? That brings me back to the work. Are there things Jeff Bezos is doing at Amazon that fascinate me? Absolutely. I pay attention to his work and his genius. I’m not him and I’m not going to waste a second trying to be. But his work is interesting. His personal fortune has no impact on my life. Or yours. My life, my family’s life, your life and your family’s life is not influenced by the personal wealth of Jeff Bezos. But I know CEO’s and business owners who grow fixated on the new house or new car of a rival, an acquaintance or somebody else they know (or know of). I saw the other say an article on Matt Lauer’s new place in the Hamptons, a mere $33M estate. That news didn’t impact my life or my family’s life one whit. Nor does the fact that Mr. Lauer earns $20M a year. Or the rumors that he may not be renewed when his present contract expires. That’s his life and it’s important to HIM. To HIS family. His public celebrity aside, I don’t much care. And since I don’t watch his morning TV show, it really hasn’t got anything to do with me. But there are other people who do have an influence on me. I catch myself falling into the trap of comparing myself with them. And they’re not so unlike Matt Lauer to me. They don’t have an impact on my life…except I let them. People can hold themselves up as the bastion of success and I can fall into the trap of looking more closely than I should at who they are, what they’re doing — and I can briefly (I try to snap out of it as quickly as I can once I see what I’m doing) succumb to changing my actions. No, it never works out well for me. It’s always a set back. And I have to work twice as hard to regain the ground I lost with the distraction. You’d think I’d learn to stop doing it altogether, but I’m not that strong. Sometimes the siren call of somebody’s success catches my attention and like the rubberneckers peering at a traffic accident, I have to look. And I have to keep looking. Until I realize what a stupid mistake I’m making. It boils down to your work. Like the old TV show, this is YOUR life. The stuff you fill your days with is going to determine the outcome. What you do, what choices you make, who you let into your life…all these things matter. It doesn’t matter how big your house is. Matt Lauer’s place in the Hamptons once belonged to Richard Gere. Richard has moved on. One day Matt will, too. Their lives aren’t where they live. Yours isn’t either. You have to live with yourself and your own choices. Own it. Do the work you most want to do. Say “no” to the things that rob you of your energy to be your best. Avoid the distractions other throw in your path, intentionally or not. 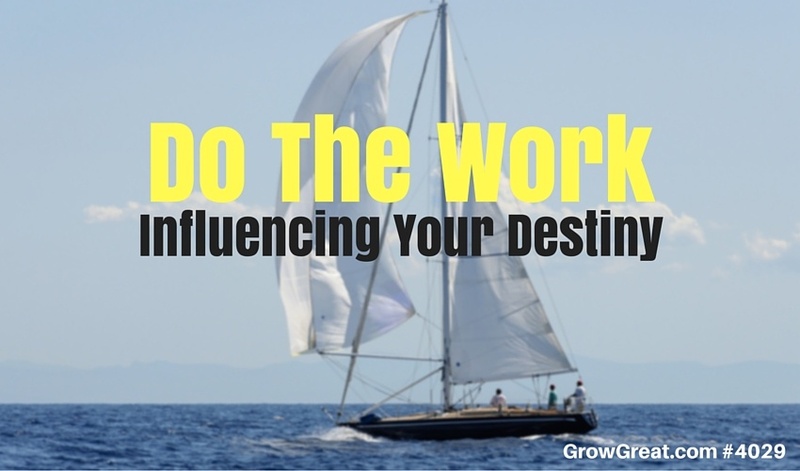 You may not be able to control your destiny, but by becoming more devoted to the work that matters most to you – and by doing it the way you most want to do it – could be your best bet to influence your destiny.